When to start wearing bogu? We have scheduled a kyu grading at my local dojo for this coming Thursday and we were discussing the format. My preference is that candidates who are taking their first kendo examination should be allowed to demonstrate basic technique without the pressure of fighting for opportunities against an opponent, or being constrained by wearing men and kote. The requirement would be for them to deliver kirikaeshi and a pre-arranged sequence of kihon attacks against an armoured motodachi. Another option or possible addition is the inclusion of the “Bokuto ni yoru Kendo Kihon Keiko-ho” or Training Method for Fundamental Technique with Bokuto. My rationale is that it is difficult enough to learn correct technique and footwork without the added complication of understanding an opponent’s timing, particularly if he or she is equally new to kendo. There is also a danger that when new kendoka are told to “fight” there is a temptation to block or move to avoid being hit, whereas if they are in the role of kakarite, they can concentrate on correct technique and posture. Grading examinations really are the “tip of the iceberg”. There is an often quoted urban myth that pre-war, adult beginners in some Japanese dojo were left to practice suburi in a quiet corner for at least a year and then admitted to the dan ranks. In the present day UK, it is more likely that you will get to wear bogu after your 6 or 8 week beginners’ course. Wearing men and kote too can be more challenging than experienced kenshi realise. Of course using these essential pieces of kendo kit eventually becomes second nature, but I have seen several instances of beginners quitting because the feeling of being blinkered by a men or being hit on the head felt so unnatural. On the other hand some brave individuals, who start kendo with the image of the armoured samurai, ready to do battle from day one in mind, find it hard to be patient while they are learning the basics. Buying bogu too early in your kendo career can be as punitive financially as it is in terms of technique development. eBay and the kendo message boards regularly have used bogu for sale and I am sure that there is much more stashed in cupboards and attics against the slim chance of the owner starting again. I am interested in your views on when we should start wearing bogu. Should we get the basics right first, or is it better to at least have a taste of keiko in armour during the early stages of our kendo careers? Brits over the age of 40 and die-hard fans of vintage TV sitcoms may remember Trigger, the dim road-sweeper in the comedy Only Fools and Horses. Trigger’s boast was that during his long career as a road-sweeper he had only used one broom, although it had had 17 new heads and nine new handles. I have a pair of kote with a not dissimilar history; I have had them for over 20 years. They were originally a present from Shinji Kawato, a bogu maker friend in Osaka. To be fair both to Trigger and to Kawato-san, I have used the original futon consistently since then, although the atama or hand parts have been replaced at least 5 times and the futon have been washed and re-dyed. The futon are now showing distinct signs of wear but are still holding up. They were recently reinforced so there should be some more mileage left in them. I have not been to Osaka for a while and I have not had the chance to take them to Mr Kawato for their regular atama replacement, so the palms have been patched in numerous places. 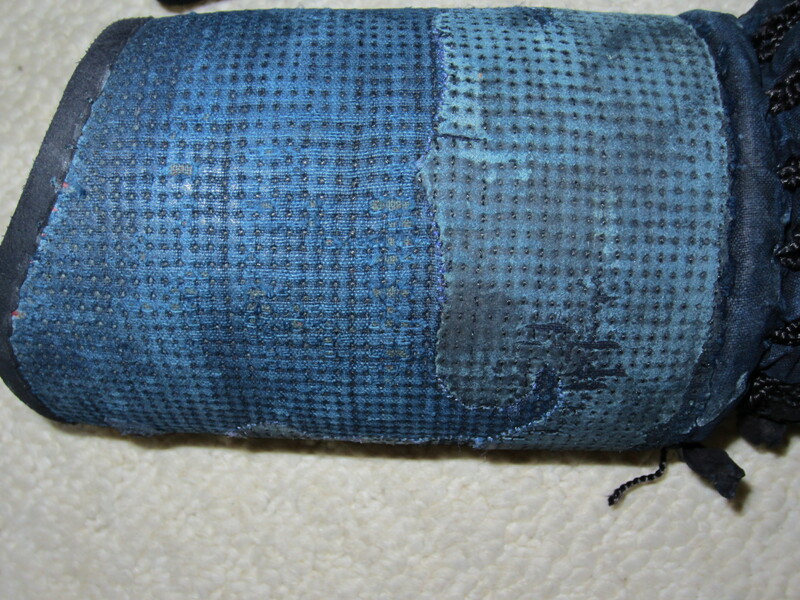 This in itself is not a problem but now the tsutsu (wrist joint) , is starting to fall apart. Nevertheless I am still reluctant to end my 20 year relationship with them. 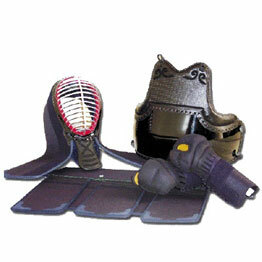 I have tried all sorts of kote over the years, including the Hasegawa type with changeable hand coverings. 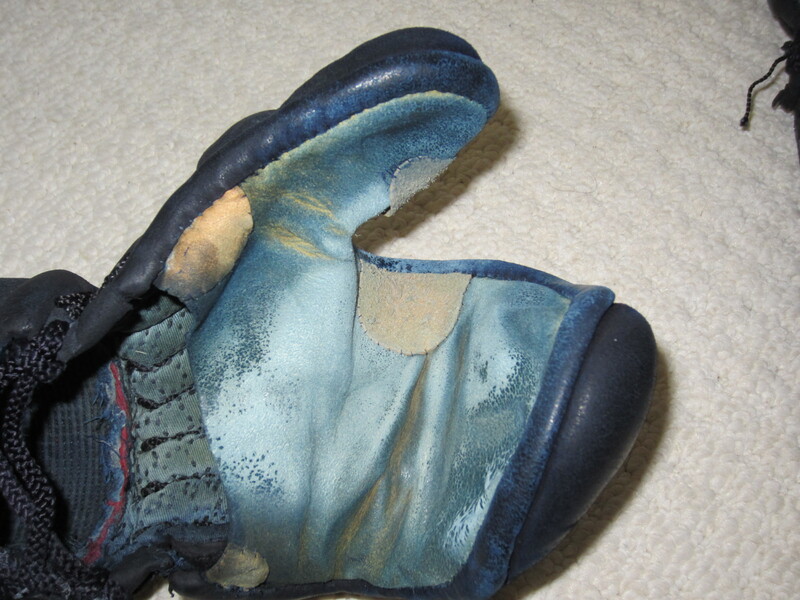 All kudos to Hasegawa for developing something new, but they remind me of gardening gloves. Why do I love my old kote? Let me count the ways. The futon are of original Japanese hand stitched 1bu construction made from traditional compressed cotton and antique wool felt. They still do a great job in protecting me from over-enthusiastic beginner’s hits. They keep the correct tube shape while allowing me to get them on and off quickly. The hands (and their predecessors) are big and comfy and I feel completely relaxed in them. The downside is that they now look distinctly scruffy. I have other newer and smarter kote but none that I enjoy wearing as much. My love for these relics may well be reason for their impending demise. I regularly think about spreading the wear, but it is these old favourites that invariably get packed for keiko. I plan to get some more good kote this year, and have seen lots of desirable products in the bogu booths at taikai and on the internet. Nevertheless I still think that the old models will find their way back to Mr Kawato for some new hands and some TLC. I have written about bogu before in this blog, but I was prompted to think about it again after getting involved in a thread on the “Kendo Business Professionals” forum on Linkedin. A kendoka started the debate by asking for advice on inserting hard protection into kote to limit injury. Some people including me, made the point that it might be due to problems with his or his opponents technique and then the discussion went on to the protective qualities of various types of kote. As often happens in these forums, the thread then became wider ranging, covering the respective merits of Japanese, Korean and Chinese made bogu and I felt that there is considerable confusion about what we spend our money on. As I do regularly when I am in the Kansai area, I took time in May, to visit an old friend, Kawato Shinji, owner of Kawato Budoguten. Kawato-san is of the old school of apprentice-served bogu craftsmen. He has made much of my bogu over the last twenty years and always offers knowledgeable, honest advice on products and their viability for repair. His view, correlated by other sources, is that most of the bogu sold these days is Chinese made, even up to and including middling expensive hand-made sets selling at $3,000 to $5,000. 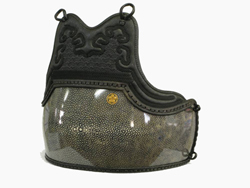 The confusion comes from the fact that whilst cheaper armour is made and assembled in China, with more expensive products, the components are made in China and the finished articles assembled and finished in Japan and Korea. In effect the difference between sourcing mid range bogu from China and Japan, is that for the latter, you are paying for Chinese product with Japanese quality control. Some of the bigger Japanese makers have their own staff members based in the factories in China to monitor the quality of output. There is also confusion about the term “hand-stitched”. Modern sewing machines make it possible to produce futon that exactly match traditional hand-stitched patterns which are by and large, indistinguishable from the real thing. In the old days “and still, in the case of the most expensive bogu” it took a craftsman a month, working 7-12, to manufacture a bogu from raw materials. 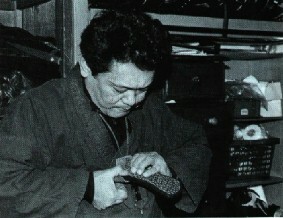 Even then the dou dai (plate) and the mune were bought in from other craftsmen. The raw material for futon is typically 7 or 8 layers of cotton that starts as a thick pile of up to 3 cm which is painstakingly compressed stitch by stitch till it reaches a thickness of 2-3 mm for 1-bu stitching or 5-6 mm for 2-bu. Traditional dou dai manufacture is equally detailed, with bamboo slats hand shaped and tied, cowhide laminated on top and then coat after coat of lacquer applied over weeks and left to dry. Specs of dust are removed with the finest of brushes in between. I bought my first good dou, when I lived in Japan and had the fun of visiting several times over 3 months to see it as a “work in progress”. In reality because work has to be multitasked and scheduled, you can expect to wait 1 to 2 years to take delivery of the highest quality handmade bogu. Top quality bogu sells for prices in the region of 1.2 million yen (around $14,500), or the price of a car. I imagine that the maker enjoys less profit per sale than does Toyota. Whilst all good kendo retailers and e-sellers try to give value for money, it is unreasonable to expect to buy a year of a master craftsman’s life for your 200 bucks. Just thinking it through, when baggage allowances can be as low as 20kg and a full set of kendo equipment can weigh 15kg, this severely limits the amount of clothing you can take, so if you are on a business trip of several weeks and you need suits and spare shoes etc. you have an inherent problem. One of my pet hates is packing for a trip that involves both keiko and refereeing or sitting on a grading panel. As well as bogu and shinai ,you need the standard blazer uniform and, if you do not want to go out looking like a penguin in the evening, a change or two of casual clothes. Gone are the days when you could pack men as hand luggage. The x-ray machine will now identify mengane, and any diligent security person will suspect that you are smuggling weapons or worse. So what to do? Friends who travel regularly to the same locations have taken to keeping spare sets of bogu and shinai to use on each visit, but for the random kendo traveler, it is a matter of taking lightweight equipment, borrowing shinai and trying to get as many wears as possible from the least amount of clothes. I have always been fascinated by the variety of doudai available and have spent hours in Japanese bogu shops staring at the selection. For some reason the more outlandish models are kept on the top shelf, (rather like magazines in the newspaper shop). I have seen dou covered in deerskin, wild boar skin and even bear skin –all of these with the hair on. I can clearly see the advantage of these in shiai. If your opponent hits dou, the shinpan would not be able to hear it. However in the forty plus years that I have been doing and watching kendo, I have never seen anyone wear one. Only slightly more common, are the dou with lacquered designs, showing scenes and animals in glorious colour. One of the few people I have seen wear one was a gentleman who regularly turned up at shiai during my time in Kansai wearing a glorious confection of gold tigers and dragons chasing around on a vermillion background. After making a startling first impression with this piece of kit, he invariably got beaten two nil, packed his dou and returned on the next occasion to display it again. More recently there has been a trend back to the old style take-dou where the original bamboo slats are visible in their naked form. Then you have the new style car paint shop and iridescent moulded finishes and the choice goes on. 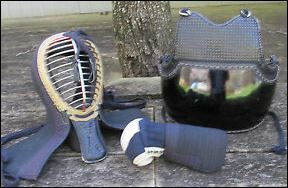 I have had two non plain black versions during my longish kendo career. One had a slightly cracked baka-urushi finish and a blue suede mune. The other was a vermillion dou, now faded to a tasteful brown, which I received as a present from my sensei. Both have mysteriously become too small for me, so I passed them on to Alan Thompson and Max Davies, both British Squad members. It was actually quite a buzz to see two medal winners at the recent Mumeishi taikai wearing my old bogu. There really seems to be no rule about which colours can be worn at which grade and it remains a matter of personal taste and confidence as to what can be worn. I notice however at occasions like the Kyoto Taikai, the majority of Kodansha (6th 7th and 8th dans) go for a plain black dou dai. It was once explained to me by a teacher who had begun his career pre-war, that black was the senior colour as in black belt, (yes! I know there are belt colours above for kodansha). In his view black had been borrowed by folk lower down the grade scale until it became the norm. Personally, I have always fancied a ray skin same dou, but not having the impudence to outshine the hanshi or a spare 500,000+ Yen, I think I will stick to black. An old kendo friend, Tashiro sensei, is currently in the UK on a business visit. Tashiro sensei is one of the few non-professional kendoka to have passed 8th dan at the first attempt. He runs a bogu business in Saga-ken called Tenpudo and is in Europe to introduce a new range of bogu called Hotaru “Firefly”. Similar to Chiba Bogu’s Mine range, Hotaru is machine made bogu that embodies the suppleness and absorbency of 2 bu hand stitched equipment. It is particularly light and easy to wear and incorpoarates various options, such as extra padding on the right kote and porous kote palms. A lot of thought has gone into the design, and features such as shorter men flaps and diagonal stitching ensure that the bogu allows freedom of movement for the user. It comes in three different quality and price ranges with a choice of titanium or duralumin mengane. There are four standard sizes and a made to measure service. Dou are not included in the Hotaru set, but Tenpudo can add these to the package. They feature some extremely good same dou lookalikes. Their web site is at http://ww4.et.tiki.ne.jp/~tenpudo7. The site is currently in Japanese, but an Enlish version will follow soon.